The Padres have announced that outfielder Franchy Cordero has been activated from the disabled list and will lead off and play center field in today’s day game at Coors Field. He’ll take the place of Manuel Margot, who is going on the DL with bruised ribs. Cordero, 23, has been on the 40-man roster since late in 2016, so no further roster maneuvers will be required to facilitate his arrival. The toolsy youngster entered the season rated tenth by MLB.com among the prospects in a deep San Diego farm system. Meanwhile, Margot is set for an early-season respite after taking a pitch to the chest. He was already cleared of any fractures, so it seems likely this’ll be a relatively short stay. Margot has struggled to post just seven hits through his first 49 plate appearances, only two of which have gone for extra bases. The organization will surely exercise patience, though, with a player who is already a premium asset in the field. Margot showed a fair bit of promise last year, when he slashed .263/.313/.409 with 13 home runs and 17 steals in his 529 plate appearances. The Padres have announced that they’ve placed outfielder Manuel Margot on the 10-day DL, retroactive to Thursday, with a strained calf. To take his place on the active roster, they’ve recalled fellow outfielder Franchy Cordero from Triple-A El Paso. The Margot move is somewhat expected — Margot’s calf injury was already known, and he was wearing a walking boot yesterday. The center fielder was batting .259/.305/.389 in what figured to be his first full big-league season. As disappointing as it must be for the Padres to lose a high-upside 22-year-old outfielder for awhile, though, the Cordero move is interesting in its own right. Cordero is also 22, and he was batting .289/.349/.520 for Triple-A El Paso — good numbers even after considering that El Paso is a great place for hitters. He played in 2015 at Class A Fort Wayne, but the Padres moved him aggressively through their system in 2016 as he batted .290/.344/.450 across three levels, demonstrating good contact ability and burgeoning extra-base power. He earned a 40-man roster spot in November. Cordero’s most significant downside at the plate currently seems to be strikeouts — he’s had 59 of them in 190 plate appearances so far this season, although that might be somewhat understandable given his youth. MLB.com rates Cordero the No. 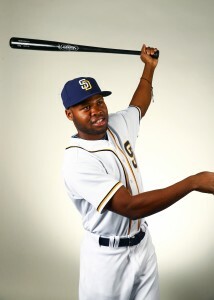 23 prospect in a strong Padres system, praising his raw power and his defense in center field. Service time considerations could play a role in the Padres’ Opening Day roster decisions on Luis Perdomo and Manuel Margot on the Opening Day roster, Dennis Lin of the San Diego Union-Tribune writes. Perdomo, a Rule 5 Draft pick last offseason, clocked a full year of MLB service time in 2016, posting a 5.71 ERA, 6.4 K/9, 2.28 K/BB rate and a whopping 59% grounder rate over 146 2/3 innings. Margot, one of the game’s top prospects, had a 12-day cup of coffee in the bigs last season. Keeping both Perdomo and Margot in the minors for a few weeks to begin 2017 would allow the Padres to gain an extra year of control over both players. In Margot’s case, the extra minor league seasoning could be necessary since Margot has missed the last two weeks of camp with a knee injury. Jimmy Rollins is off to a slow start in the Giants’ camp, with just three hits in his first 26 at-bats for an ungainly .113 average. Despite the lack of production thus far, the veteran infielder tells Andrew Baggarly of the Bay Area News Group that he isn’t yet feeling a crunch to perform given his non-roster status. “I’d love to start driving some balls. But pressure? No, it’s not pressure. You start doing that, then you’re really starting to go the wrong way,” Rollins said. As Baggarly notes, Rollins’ performance is somewhat difficult to evaluate since he appeared in only 41 games last season and none after June 8, so “the Giants must determine whether Rollins’ lack of results is due to diminished skills or whether he’s a veteran who needs a little extra time to regain his stroke.” Rollins gave no hints as to how he would proceed in his career if he didn’t make the Opening Day roster. Andre Ethier will undergo an MRI on his back on Monday, Dodgers manager Dave Roberts told reporters (including Bill Plunkett of the Orange County Register). Ethier has been bothered by lower back stiffness over the last two weeks and, since this is an unfamiliar injury for the veteran outfielder, Roberts said the club will “take it slow” in giving Ethier time to recover. Ethier played just 16 games last season due to a broken leg, and he is entering his last guaranteed year under contract with L.A. He needs at least 550 plate appearances for his $17.5MM option to vest for 2018, and while that much playing time may have been questionable anyway given the crowded Dodgers outfield, a significant back injury would certainly put it out of reach. With the Triple-A postseason now complete, the Padres announced late Tuesday night that they have promoted top outfield prospects Hunter Renfroe and Manuel Margot as well as catcher Austin Hedges, second baseman Carlos Asuaje and lefties Buddy Baumann and Jose Torres in a final wave of September call-ups. 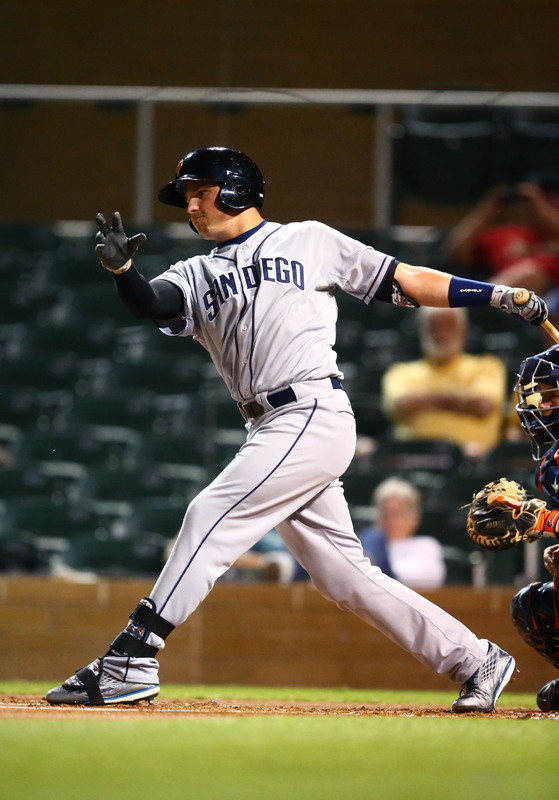 Of the bunch, Renfroe and Margot rank firmly within the game’s top 100 prospects, while Asuaje ranks as one of the Padres’ best prospects after coming to San Diego alongside Margot in the Craig Kimbrel blockbuster. Hedges, meanwhile, is a former top 100 prospect in his own right that saw his rookie status expire while struggling in the Majors last season but enjoyed a monstrous season in Triple-A this year. Starting with Margot, the 21-year-old center fielder currently ranks 16th, 20th, 27th and 39th on the respective midseason top prospect lists compiled by Baseball Prospectus, ESPN’s Keith Law, MLB.com and Baseball America. Margot was one of the headliners of the Padres’ return for Kimbrel and demonstrated many of the reasons that he’s so well-regarded with a strong 2016 season in which he batted .304/.351/.426 with six homers, 21 doubles, 12 triples and 30 stolen bases in 566 plate appearances at the Triple-A level despite being more than five years younger than the league’s average age. Scouting reports peg Margot as a plus defensive center fielder due to his above-average speed and strong reads, and it should be mentioned that he racked up 18 outfield assists in Triple-A this year. His hit tool draws strong reviews as well, with the only real questions regarding his skill set centering around his power (or potential lack thereof). Even if he’s not a big threat in terms of clearing the fences, though, Margot profiles as a regular that works the count, hits for average, gets on base, steals bases and plays quality defense. Renfroe, meanwhile, ranked 41st on MLB.com’s list, 43rd on BP’s and 66th on BA’s. The 24-year-old was the No. 13 overall pick back in 2013, and while his arrival to the Majors took longer than some might’ve anticipated, he’s hit quite well in parts of two seasons with Triple-A, slashing a combined .310/.339/.568 with 36 homers in 154 games. Those numbers, of course, are aided somewhat by the hitter-friendly Pacific Coast League, and it’d be encouraging to see Renfroe walk in more than four percent of his Triple-A plate appearances. But, his 20.5 percent strikeout rate isn’t through the roof, and the reports on him laud his raw power and bat speed as well as his arm strength in right field (where he fell just shy of Margot with 17 outfield assists this season). Even if his discipline never improves, Renfroe could be an power-oriented regular with an OBP in the low .300s and solid defense in right field. Turning to Asuaje, MLB.com rates him 20th among San Diego farmhands and praises his contact skills, hand-eye coordination and gap power/line-drive stroke. Asuaje is listed at 5’9″ and 160 pounds, so the odds of him ever hitting for much power, especially playing his home games at Petco Park, are fairly long. though MLB.com’s report on him does mention his “surprising” pop and give him a chance to crack double digits in homers. The 24-year-old Asuaje was brilliant with El Paso this season, hitting .321/.378/.473 with nine homers, 32 doubles and 11 triples. He’ll be in the mix for the second base job in 2017, and even if he loses out to breakout slugger Ryan Schimpf or a returning Cory Spangenberg, Asuaje could crack the roster as a utility player. He’s appeared at third base, left field and (briefly) shortstop throughout his minor league tenure and could help the Friars at a number of positions. Hedges didn’t receive the call-up that many (myself included) were anticipating earlier this season due largely to the fact that Derek Norris played himself out of a potential trade by hitting just .183/.253/.320. With Norris and the out-of-options Christian Bethancourt serving as manager Andy Green’s primary receivers in the bigs, the Padres left Hedges at El Paso to continue to hone his offensive skills, and he delivered in a big way, hitting .326/.353/.597 with 21 homers. That’s a critical development for a player who has long been touted for standout defense but had previously struggled to hit. Hedges batted a woeful .168/.215/.248 in 152 MLB PAs last season, and the .225/.272/.314 slash he compiled in 133 career games at the Double-A level was concerning as well. Now, with such an impressive 2016 season in his back pocket, it’s easy to envision the Padres finding a way to clear a roster spot for him in 2017. Neither Baumann nor Torres ranks among San Diego’s top minor leaguers, but both had strong minor league seasons. Baumann posted a 3.14 ERA with a 31-to-12 K/BB ratio in 28 2/3 innings, and the 28-year-old will return to the Padres for a third stint this year. Torres, just 22, split the 2016 campaign across three minor league levels after beginning in Class-A Advanced and compiled a 2.24 ERA with 8.8 K/9 against 3.2 BB/9 in 64 1/3 innings of relief. A trip to the doctor resulted in generally positive news for Mets third baseman David Wright, Jon Heyman of Fan Rag reports. Wright’s surgically-repaired neck is said to be healing as hoped, though Wright will not even be able to do full-scale workouts until next spring. Still, it seems that he and the team have reason to hope that he’ll be able to attempt a comeback for 2017. Meanwhile, the Mets are considering an interesting way of working injured starters Jacob deGrom and Steven Matz back into the major league mix, as MLB.com’s Anthony DiComo was among those to report. If both are ready to pitch, but not handle a full starter’s workload, then the pair could work in tandem in a single outing, skipper Terry Collins suggested. With wins at a premium, that ought to represent a potent one-two punch, especially since the righty/lefty combo would be hard to match up against. It doesn’t appear as if the investigation into sexual assault allegations against Pirates infielder Jung Ho Kang is progressing much, as Andrew Goldstein of the Pittsburgh Post-Gazette reports. The Chicago police who are looking into the claims say that they are not having success in making contact with the woman who says she was assaulted by the Korean star. At this time, though, it appears that it still remains an open matter. The police “are seeking clarification on several items to corroborate the allegations made,” police spokesman Anthony Guglielmi said. MLB commissioner Rob Manfred has stated that the league will not take action on the matter until the investigation has progressed. Four significant Padres prospects have notably yet to receive major league promotions this year, as Jason Martinez of MLBTR and Roster Resource recently explored. The organization has preferred to keep those players together for the Triple-A playoffs, MLB.com’s AJ Cassavell writes, with manager Andy Green saying that more call-ups are expected once the PCL campaign has wrapped up. Catcher Austin Hedges seems to be an easy call now that a promotion won’t cost the team a year of control, as he’s already on the 40-man and the team just lost Christian Bethancourt. Manuel Margot is also on the 40-man, but the team may wish to watch his service time. Meanwhile, a bump for outfielder Hunter Renfroe and/or infielder Carlos Asuaje could make sense since both need roster spots this winter for Rule 5 protection. The Padres have placed righty Tyson Ross on the 15-day DL (retroactive to April 5) with right shoulder inflammation, MLB.com’s AJ Cassavell tweets. Via the San Diego Union-Tribune’s Dennis Lin (on Twitter), Ross noticed his shoulder felt unusual during his first bullpen session after starting on Opening Day. Ross is optimistic he’ll return after missing the minimum amount of time. Clearly, the loss of Ross (who produced a 3.26 ERA, 9.7 K/9 and 3.9 BB/9 as one of the few bright spots in a rough Padres season in 2015) would be a blow to the Padres, particularly given that Ross is eligible for free agency after 2017 and could be traded at some point. Right now, however, there’s no indication the injury is serious. Manager Andy Green characterized the move as precautionary (tweet). The Padres may have missed their window to cash in on most of their trade assets, Keith Law tells Buster Olney on the Baseball Tonight podcast (33:30 minute mark). While Law praised top prospect Manuel Margot for his solid tools and excellent baseball IQ, the rest of the farm system is rather bleak. Law believes Ross may be the only player on the major league roster who could fetch a franchise changing prospect. Derek Norris could return some value, but his shaky defense hurts his trade value. Similarly, other trade candidates aren’t likely to bring much in return. Of course, the podcast was recorded prior to Ross being placed on the disabled list. Law highlighted the long injury histories of Ross and Andrew Cashner which could come back to bite the Padres at any time. Executive Ron Fowler has a difficult job on his hands convincing local fans that the front office has a plan, writes Bill Shaiken of the LA Times. After a disappointing 2015, the club seemingly went backwards over the winter with Justin Upton gone and Craig Kimbrel traded to Boston. The team appears to be feigning contention while planning a rebuild. This just one year after they spent a bushel of prospects and dollars in an attempt to compete in the NL West. Fowler admits the club was caught a little flat footed when the Dodgers started spending money like the Yankees on steroids. Their big spending rivals have the Friars looking for other ways to sneak into contention.